After checking out of the mom-and-pop motel in Gardnerville, we check into the Super 8 at Carson City the same morning. It's just a few miles up the road, but good to establish a home base for our three days here. There's a symposium on the Virginia & Truckee Railroad going on the three days we're in town, part of which is at the Nevada State Railroad Museum just up the road from the motel. Herein lies a dilemma. I can abandon my spouse and attend the symposium, some of which surely will include lectures and slide shows in stuffy motel conference rooms, or get out into the open air and see what is left of the real thing. Having never been here before, and wishing to be a better husband, I choose the latter. 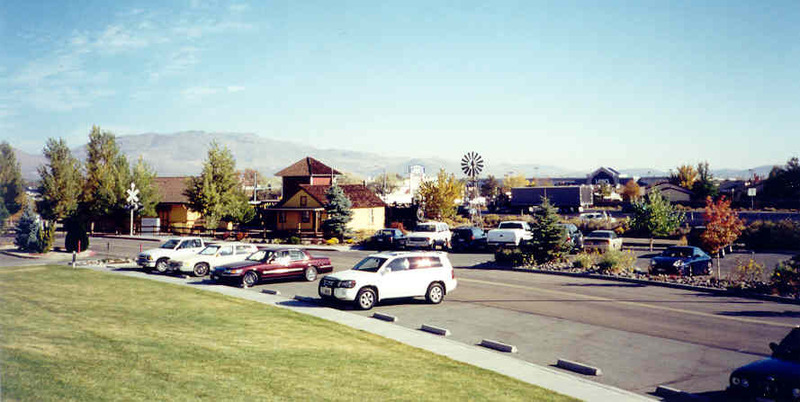 Carson City has grown tremendously since the days of Beebe and Clegg, and is now built up all the way to Mound House, where the narrow gauge Carson & Colorado once met the V&T. Turning north, the old road to Virginia City starts to climb and bend, much like the V&T's track did before it was abandoned in 1938. We find a parking spot near the re-created "new" V&T Railroad, but walk uptown for a look around before riding the train. The town reminds me much of Central City, Colorado (which I haven't seen since gambling took over). Plenty of visitors ply the old board sidewalks and rinky-tink piano music comes out of several barrooms. There are umpteen gift shops, including even one that specializes in railroad stuff. Unlike Central City, there was never debate about instituting gambling; in Nevada, it is everywhere, including supermarkets and laundromats. After a walk up and down B and C Streets, lunch, and a guided tour on a barge drawn by a farm tractor, we purchase tickets from the lady "agent" in V&T baggage-mail car No. 13 (link to photo on the Comstock Carshops website), parked on C Street. This car, built in 1873 especially for gold shipments, is the only intact original V&T car in Virginia City. The railroad itself, is three blocks lower, which has caused some confusion to unknowing tourists, who sometimes wait in front of Car No. 13 for the train to arrive, perhaps thinking it is some sort of rubber-tired tram like those in zoos. Physical reconstruction of the "new" V&T was begun in 1975 by Bob Gray, a noted historian, photographer and author from California, after approximately a decade of preceding research and legal work. Gray spent plenty of time visiting the V&T in the 1930s, and was aboard the last excursion over the Virginia City line in 1938. The first revival train operated in 1976, using a 4-4-0 leased from Short Line Enterprises, which had previously been owned by the 20th Century Fox movie studio. The following year, with the 4-4-0's lease considered too expensive, a tiny 14-ton Porter 0-4-0T was tried. Though it could pull one car, smoke from the diminutive machine drifted through the car, choking out the passengers until an extra-tall smokestack was applied. 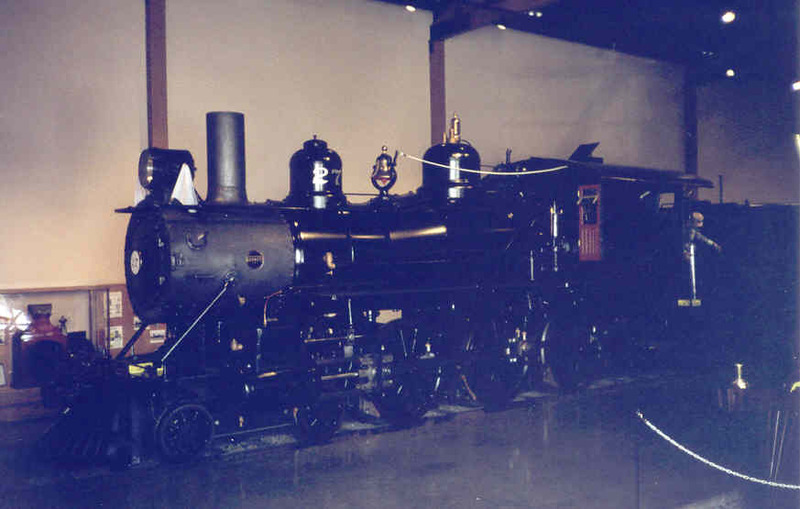 Later that year, help arrived in the form of a small 2-8-0 found in a wooden enginehouse at Grand Ronde, Oregon, and in 1990, a Baldwin 2-6-2 arrived. 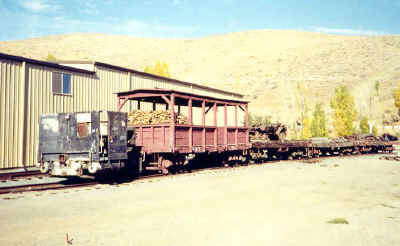 The latter, once owned by the Hobart Southern logging railroad, belonged to the late Jim Boynton, a retired Western Pacific engineer. Motive power for the "new" V&T is presently all-diesel until the steamers are repaired. On our trip, former Quincy RR 44-tonner No. 3 (borrowed from the Portola RR Museum) pulled the train. The railroad recently swapped the former Western Pacific turntable from Oroville, California for another GE unit for the 2003 season. By 1991, tracklaying had progressed the two and a half miles down to Gold Hill, after Tunnel No. 4 had been shored up and Tunnel No. 3 (link to photo on the Central California Rails website) bypassed due to unstable conditions. Tunnel No. 5 was daylighted by highway construction. 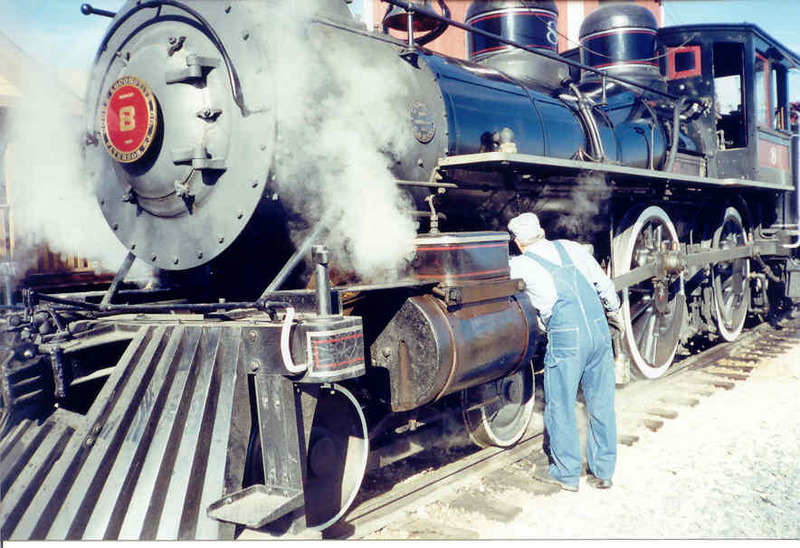 Steam operations continued through 2001, when compliance with the new FRA regulations brought both engines down for repairs. For 2002, the railroad borrowed an ex-Quincy Railroad GE 44-tonner from the Portola Railroad Museum, and has since acquired an ex-military GE 80-tonner from the same museum. 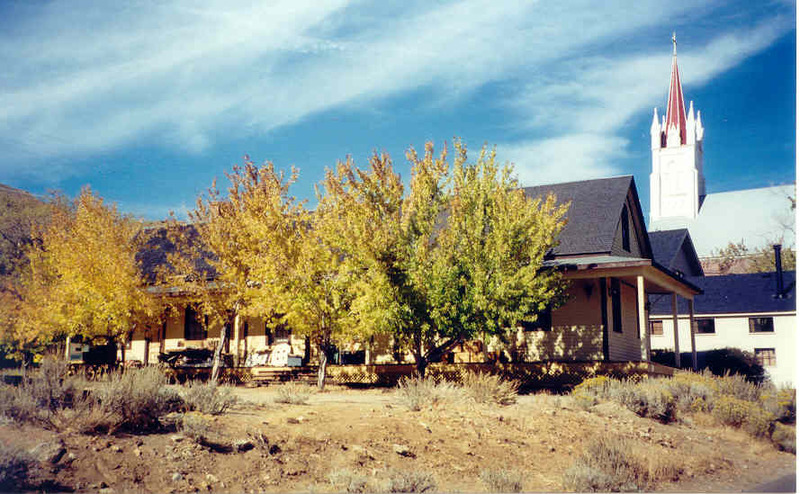 Near the ex-Northwestern Pacific combination car that serves as gift shop and depot, the original Virginia City passenger station still stands, used as a private home. Closed Tunnel No. 6 is just to the left of the photo. This building was later supplanted by a second passenger station behind the church in the background. 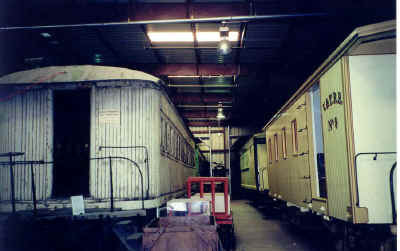 The rebuilt railroad's "depot" is an un-sided shelter near their gift shop, inside combination car No. 25 (link to photo on the Central California Rails website), which is actually of Northwestern Pacific heritage though lettered for the V&T. The very first V&T depot is at the end of track nearby, however, used as a private home, and the original V&T freight station is four blocks away, separated by closed Tunnel No. 6, directly in front of St. Marys Catholic Church. There's a restored Burlington wooden caboose on display at the terminal as well. 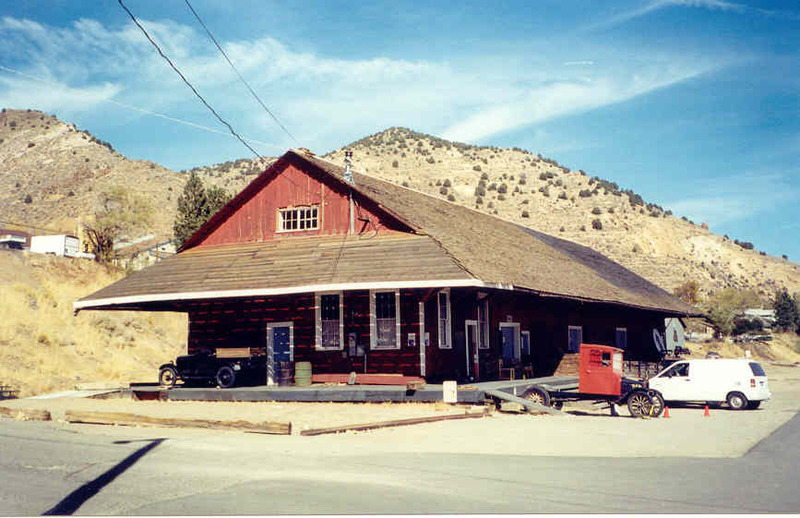 This building was the V&T's freight station in Virginia City. It is still owned by persons friendly to rail preservation and looks in reasonable shape. This Burlington wood caboose sits next to the new V&T terminal. Though historically incongruous, it looks to be in good condition. 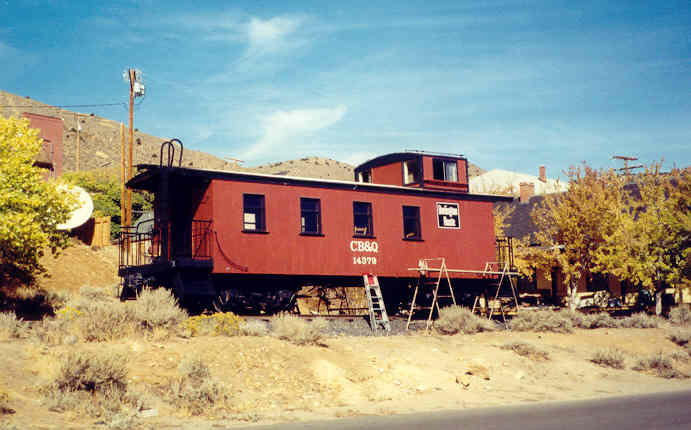 This caboose carbody behind the Virginia City freight house looks of V&T origin, but is said not to be. The short ride (link to photos on James D. Umbach's website) is entertaining, with good narration of historic sites along the way. Near the edge of town, the train passes the Chollar Mine (link to photos on the RoadTrip America website), which has underground tours but is unfortunately closed today, the restored Fourth Ward School (link to photos on the RoadTrip America website), and the road's maintenance and storage facility, a two-stall metal enginehouse. The 44-tonner is blowing smoke rings frequently, which amuses patrons. At the Gold Hill stop, I mention who I am to the crew, who indicate a visit to the enginehouse would be possible. None of them have heard of RyPN, though they do remember and miss Locomotive & Railway Preservation magazine. 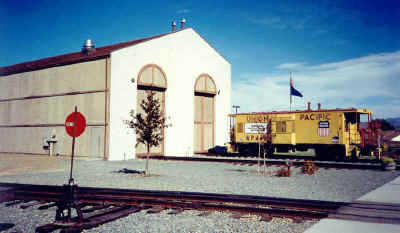 This two-stall metal enginehouse is the railroad's repair facility. The original wooden roundhouse of the V&T was located to the left of and behind the metal building. Returning, I follow the gravel road down to the enginehouse, again introduce myself, and am allowed to walk around. The new enginehouse sits beside the old V&T turntable pit and does not cover the footprint of the former wooden roundhouse, which varied between four and six stalls. Both 2-8-0 No. 29 (link to photo on the SteamLocomotive.Info website) and 2-6-2 No. 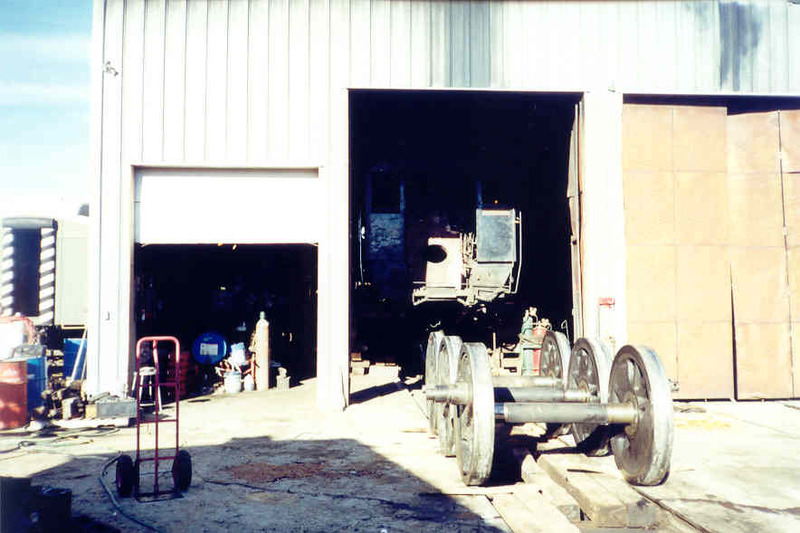 8 (link to photo on the SteamLocomotive.Info website) are dismantled for repairs inside and it is unclear if they would be ready for the 2003 season (they weren't). No. 29 sits on blocking, with all wheels removed; the boys tell me it was difficult rolling out the center blind drivers without dropping them in the inspection pit. These driving wheels came from under No. 29, still dismantled inside. Outside, there is another ex-NWP wooden coach, a tiny Brookville gas locomotive, a 12-wheel observation car (which I later determine is from the Bangor & Aroostook in Maine), and No. 1251, an ex-SP, Sacramento-built 0-6-0 that once sat in a Stockton, California park. 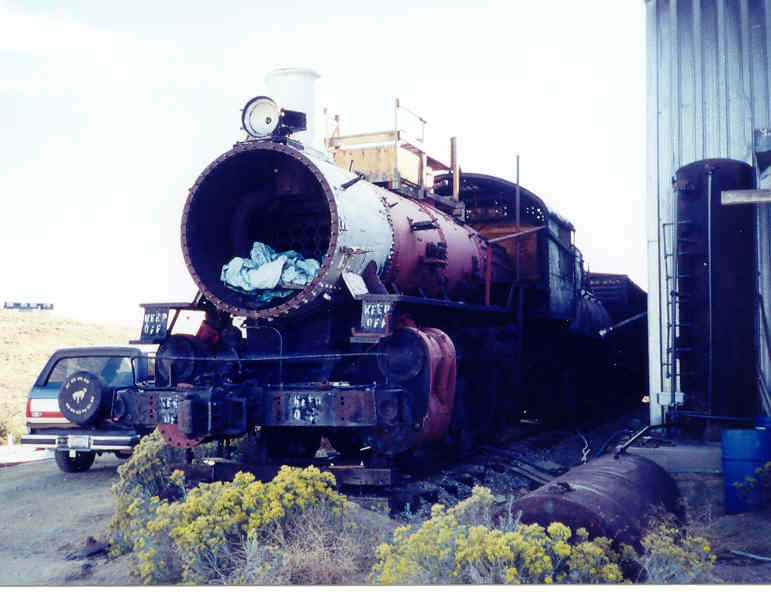 The latter was brought here in 1984 and partly dismantled for repairs, ostensibly to become a 2-6-0 and operate. This never occurred and the locomotive has sat in limbo ever since. A large turntable bridge sits in two pieces near the open pit. It was originally from Oroville, California on the Western Pacific. Plans included cutting it down to fit the old V&T pit, but were never carried out; the table has since been traded to Portola, where they plan a replica wooden roundhouse at their museum. V&T 29, a 2-8-0, and No. 8, a 2-6-2, are both dismantled inside the enginehouse and difficult to photograph. 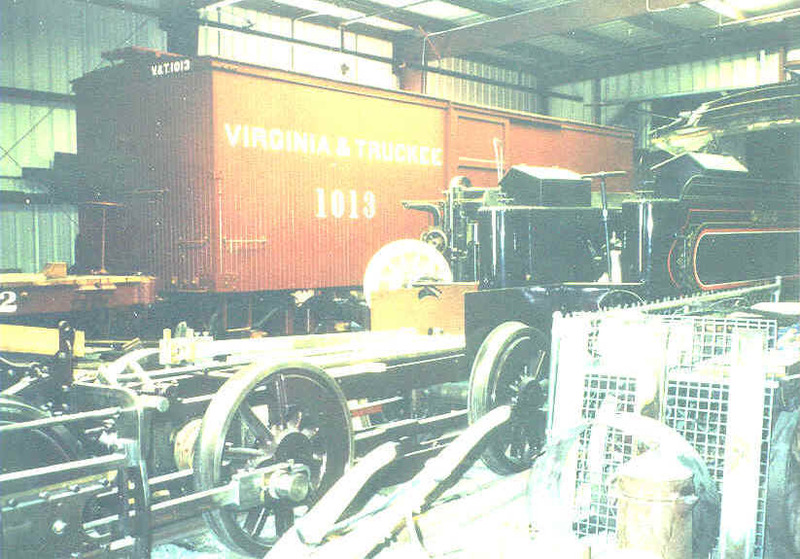 This former SP 0-6-0 came from a park in Stockton, California, intended to be converted to a 2-6-0 and become V&T No. 30. After dismantling, no further work was done. As mentioned in RyPN several times, plans are still afoot to rebuild the entire line down to Carson City, with serious consideration and possible funding from the Nevada Legislature. Because growth has overtaken the capitol city, the rail line cannot return to the fine old depot downtown, but would terminate near Route 50 on its eastern edge. 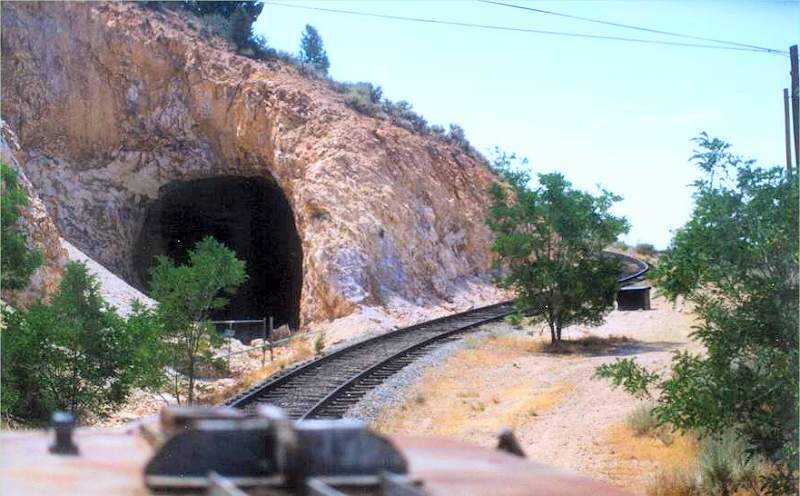 This project is known as the Northern Nevada Railway Foundation, the name of which, to me, confuses it with the preserved Nevada Northern Railway, over 300 miles to the east. Having first read of a V&T rebuild proposal in 1961, I won't hold my breath until it happens, but it looks now to have at least some possibility of fruition if the economy ever recovers. The group's proposal can be seen on their website, including plans to skirt the Overman Pit, a post-V&T mining operation just below Gold Hill that encroached on the old roadbed. Back in Carson next morning, we breakfast at a place next to the motel, whose walls are covered with historic photos of the V&T. A drive around the city shows the old V&T is not forgotten, 52 years after its demise. On Carson Street alone, there is a Roundhouse Motel, a Station Grill, a Carson Station Hotel and Casino and the Ormsby House, all of which make reference to the long gone railroad. 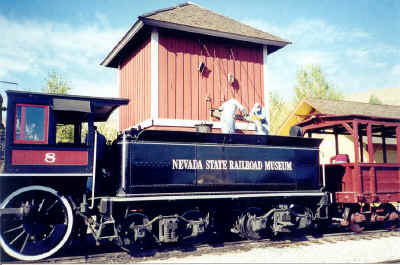 A V&T steam train is even seen on the Nevada state seal. We visit the Nevada State Museum first, located in the old Carson City Mint building, with an adjacent new wing. 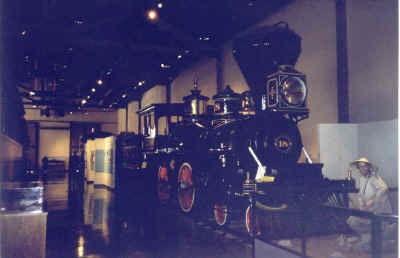 Exhibits include the state's natural as well as its human history, with not much mention of the railroad. In the museum's basement is a walk-through mine exhibit, replete with rails in the floor. In years past, there was a locomotive displayed in the courtyard, the narrow gauge Glenbrook 2-6-0 from the Carson & Tahoe Lumber & Fluming Co., west of town. The engine is now dismantled down the road at the railroad museum. 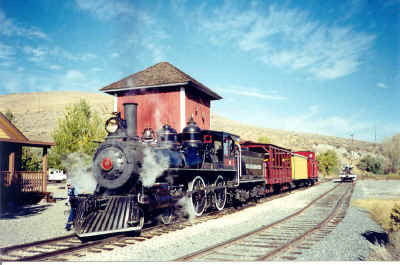 Carson City's Mills Park has a two-foot gauge gas-powered train, operated by the Carson City Railroad Association. There is a large model railroad in the building behind. In the afternoon, we visit Mills Park on the west side of town, where the Carson City Railroad Association has installed a 1.3-mile loop-to-loop operation, built to two-foot gauge. Called the Carson & Mills Park Railroad, the line has two homebuilt gasoline locomotives. A large HO model railroad is operated inside the group's depot. 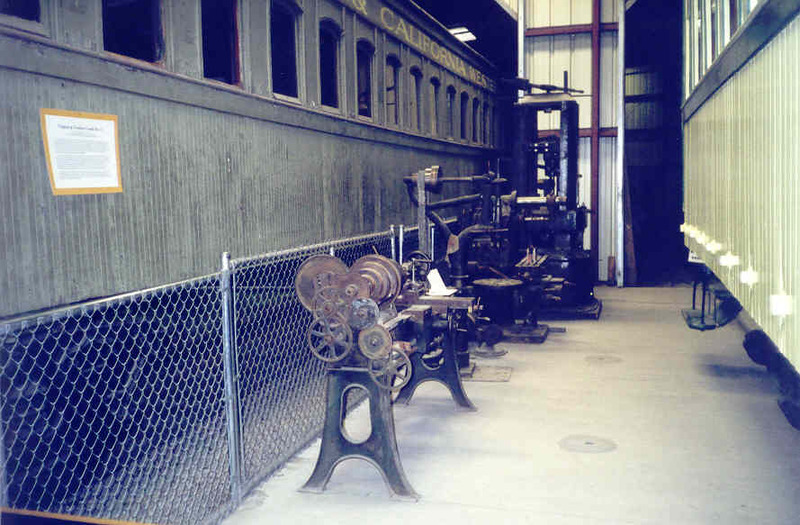 Carson City's main attraction is, of course, the Nevada State Railroad Museum, and I've been saving a visit for Sunday, which will have live steam operation in conjunction with the V&T Symposium. The museum is within sight of our motel, and we've passed it numerous times since coming into town, but there was little activity evident. This morning, old No. 8 is steamed up with a vintage train, taking water at the replica water tank. After looking at dead, dismantled and derelict steam locomotives the whole trip, finally the past has come alive! Live steam at last! The much-traveled No. 8 sits regally in front of a reconstructed V&T water tank, with a period train. For those who don't know its history, old No. 8 is a well-traveled engine. Built at the Cooke works in Patterson, New Jersey in 1888, it worked a couple of years out of the Mile High City on the Denver, Texas & Fort Worth Railroad, a Colorado & Southern/Fort Worth & Denver predecessor, before being sold to the St. Louis, Iron Mountain & Southern, a Missouri Pacific predecessor. In 1906, the locomotive was sold to the Dardanelle & Russellville, a still-operating shortline in Arkansas. In 1940, the Twentieth Century Fox movie studio purchased it; its first appearance was in the movie Jesse James, filmed on a defunct branchline in southwest Missouri. The studio then used the engine and two wooden ex-D&R passenger cars on its California movie ranch. In 1971, the locomotive and cars were acquired by Short Line Enterprises, today known as the Train Source . After some initial California movie and TV work, No. 8 was dispatched to Virginia City to start operations on the "new" V&T in 1976. 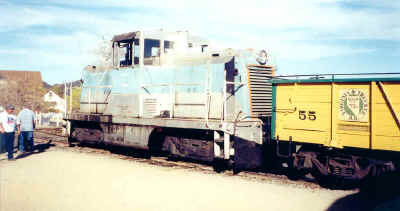 After a year, it was transferred to CSRM at Sacramento, and then spent time running on the Sierra Railroad at Jamestown. One side trip even took it by truck to Montana, where it was steamed briefly on some defunct ex-Milwaukee trackage to celebrate the 100th anniversary of the completion of the Northern Pacific. In 1988, it was acquired by NSRM, where it has operated ever since. A coalburner for most of its career, the engine was converted to oilburning in 1973, using the discarded oil tank from V&T 2-6-0 No. 20 (which itself was restored back to its original 1870s woodburning appearance for display at the Railroad Museum of Pennsylvania). No. 8 is still a fine-looking locomotive, even though its "real" in-service history did not include Nevada. It now sports a mismatched set of pony wheels, after a flange on a previous pair let go. Such practice was common on eight wheelers as they aged after the turn of the century; some of the pony wheels were not even close in diameter. Looking across the parking lot, one can see the modern surroundings that have enveloped the Museum, an oasis of antiquity in a sea of commercialism. 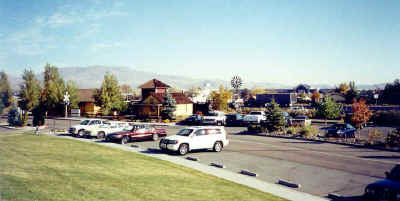 The Museum itself, located out at the edge of town when begun in the 1970s, has now been surrounded by modern strip development, though it has good exposure along busy U.S. 395. There are two main buildings. The one next to the parking lot houses two tracks, containing three engines and one passenger car, all splendidly restored. Inside are V&T 4-4-0s No. 18 and 22, plus 4-6-0 No. 27. [4-4-0 18] Lighting in the main display building was a bit subdued for my little point-and-shoot camera. No. 18 was built in the Central Pacific shops at Sacramento, which I visited earlier in the trip. No. 18 (link to photo on the Steam Locomotive.Info website) built by the Central Pacific at Sacramento, was used many years by the V&T as a snowplow engine, with a huge wedge plow mounted on the front. It was sold to Paramount Pictures in 1938, and first appeared in the epic 1939 movie Union Pacific, also making an extensive western trip (link to photo on the Denver Public Library Photo Collection website) under steam in front of UP's then-new (and unsuccessful) steam turbine-electric locomotives. The ancient steamer proved more reliable than the turbines, and lived to make several more movies. During its last restoration, it was determined that the iron boiler was not realistically safe to operate anymore, so it remains a static, rollable display. No. 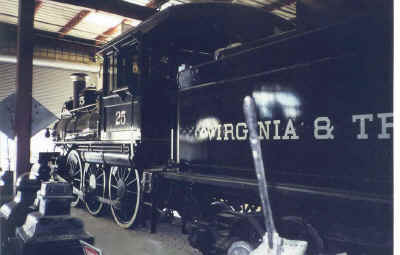 27 was the last engine acquired new by the V&T. It powered the last train in 1950, and has been displayed at different locations around Carson City and also at Virginia City. Substantial mechanical repairs were completed in the last restoration before a decision was made that it would be cosmetic-only. No. 22 (link to photo on the Steam Locomotive.Info website), also a movie and TV star, was sold to Paramount in 1937, and is still operable on special occasions today. The 1875 Baldwin has been reconverted to a woodburner, and represents its 1870s appearance. No. 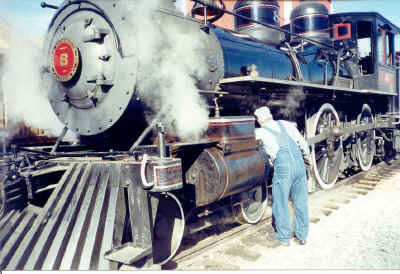 27 (link to photo on the Steam Locomotive.Info website), the last V&T engine to operate in regular V&T service in 1950, has seen substantial repair work in recent years, but remains inoperable. These repairs included welding up some frame breaks that required special techniques due to the frame's odd alloy composition, and testing of the boiler shell (which remains tubeless inside). Given to the "successive governors of Nevada" by the V&T trustees, the locomotive was displayed variously at Carson City and Virginia City over the years before coming to NSRM. The original plan to restore it to running order was halted by a dispute between the two communities over who should have the engine. 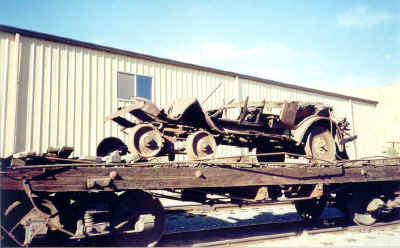 It's present appearance duplicates that of 1941, when it was repaired by the SP at Sparks, Nevada, receiving a steel cab from a scrapped SP 4-4-0 in the process. The Museum's display building is an odd, incongruous mix of modern materials, functional but not very fitting or attractive. The Museum's large repair building is stuffed with wooden V&T cars, in derelict and fully restored condition. Old shop machinery has been saved also. This lathe and mill are as old as the wooden cars behind them. The display building, which also houses the gift shop, protects and displays the equipment effectively, but its exterior is an odd, unattractive combination of concrete block, glass, metal and Texture-111 plywood. The two tracks lead out to the wooden gallows turntable, so all of the rolling stock may be easily removed. 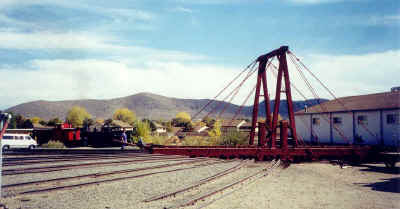 The Museum's wooden gallows-type turntable was built using old Southern Pacific plans. The other building, which was constructed first, has five stall tracks leading out to the turntable and is divided into workshop, storage and display areas. It is a metal pre-fab structure, though the front doors have angled tops like a wooden enginehouse of old. Much of the remaining rolling stock of the V&T is jammed inside, some splendidly restored, some still in sad shape after decades of outdoor storage. No. 25, the V&T's first 4-6-0, peeks out the door, in operable condition, though it is quiet today, with the steam dome cover removed to keep the boiler dry. Sold to RKO Studios in 1947, it too appeared in several films and powered a UP employees special out of LA in 1955 before being parked for years at the UP's East LA yards. The State of Nevada acquired it in 1971, and it spent some time parked at Mound House before the Museum site was established. Nos. 25 and 22 only operate a couple of times a year, but I'm sure Lucius Beebe's corpse is smiling in his mausoleum when they do. Ten wheeler 25 still operates occasionally, usually on July 4. A beautiful Baldwin classic, with high 69-inch drivers. Behind No. 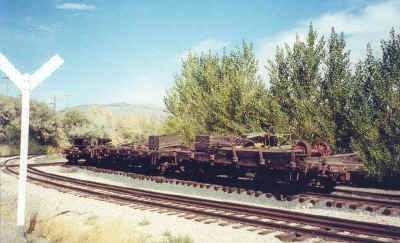 25, on dual-gauge track, are the Glenbrook, a narrow gauge 2-6-0 from the nearby Carson & Tahoe Fluming & Lumber Co., and the Joe Douglass (link to photo on the Nevada State Railroad Museum website) , a narrow gauge 0-4-2T that originally ran on the Dayton, Sutro & Carson Valley RR at nearby Dayton, Nevada. After the latter company disposed of it about 1900, the Joe Douglass moved on to construction projects in California, being abandoned then saved in the 1940s by a succession of owners. Behind the 25 is the narrow gauge Joe Douglass, a former Nevada engine that ended its days working dam construction in California. Cosmetically in great condition, it does not operate. The Glenbrook sat for many years on display near the old mint building in Carson City before coming to the Museum, where it was dismantled for operational repairs. There, the running gear and tender were rebuilt, with a new boiler obtained from a contractor. Unfortunately, the new boiler did not fit the chassis and is now for sale. Future efforts at operation will utilize portions of the original boiler shell, which has been taken apart into individual sections. The Joe Douglass has been cosmetically restored, and has been trucked to other sites on occasion for display. The running gear and tender of the Glenbrook are fully restored. 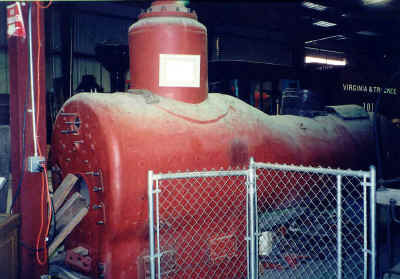 Future plans include reusing parts of the original boiler to complete the restoration. This welded boiler was ordered for the narrow gauge 2-6-0 Glenbrook, but unfortunately did not fit the chassis. It is presently for sale. The upright cylinder is the original boiler shell of the Glenbrook. Among the displays in the main building, I wander into Walter Gray, former head of the California State Railroad Museum, who I've known for some years. Quiet and soft spoken on an individual level, Walter is actually a great communicator, and was a major driving force behind the creation of CSRM and the state's acquisition of Railtown 1897 at Jamestown, though he has since moved on to a different state job in Sacramento. He introduces me to Kyle Wyatt, now an employee at CSRM, who himself was instrumental in developing the Museum in Carson City. Together, they point out a pair of doors from the old Carson City enginehouse of the V&T, a subject near and dear to my heart, about which I will elaborate later. These battered wooden doors are among the very few artifacts saved from the old V&T shops downtown. That building's demise caused the author great heartbreak when it was razed. The pair get me access into the Museum's restoration shop, which contains the body of the V&T's McKeen car No. 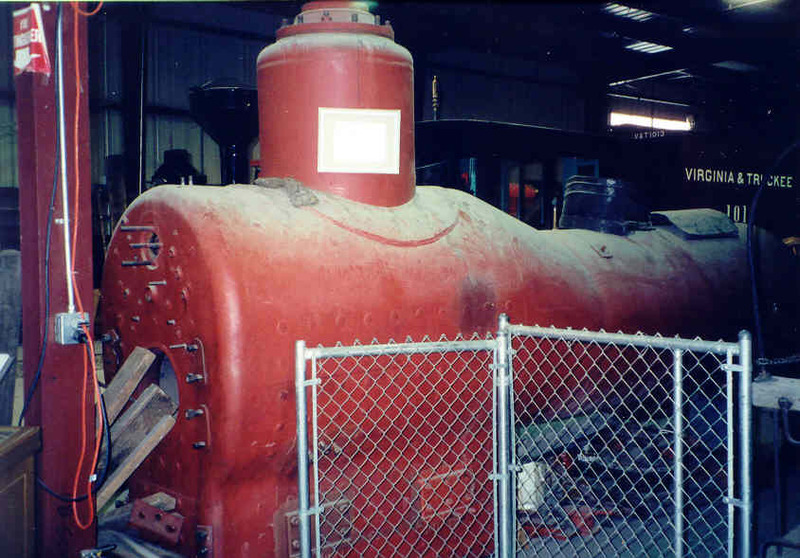 22 (link to photos on the Nevada State Railroad Museum website) undergoing repairs for eventual operation. This car was bought by the V&T in 1910, to cut losses of passenger operation on the Virginia City line, but it did not work out well on the route's sharp curves and steep grades, being relegated to the flatter Reno-Minden runs. 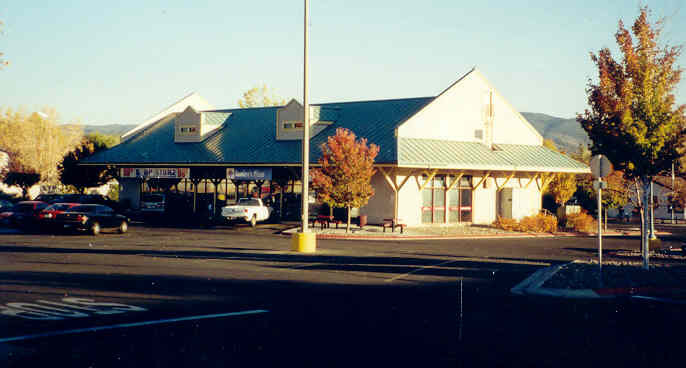 After retirement, the carbody became a Carson City diner, then the office of a plumbing shop just up the road from the Museum. When that business ceased, the McKeen and the body of a Hall-Scott ex-Nevada Copper Belt gas-mechanical car (link to photo on the Nevada State Railroad Museum website) were donated. 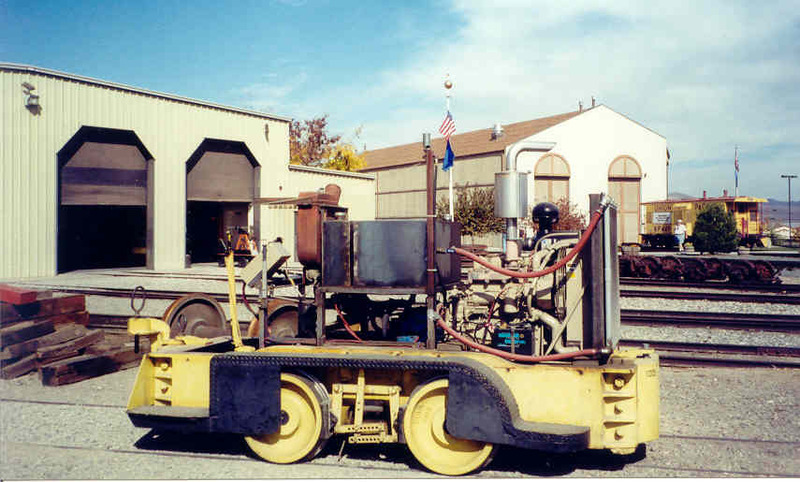 The McKeen carbody restoration is well along, but no work has begun on recreating the complicated power truck, which will require an all-new fabrication. The unique McKeen engine (link to photo on San Diego Historical Society website) was an unusual design, which may be supplanted with a newer power plant in the rebuilt car. One problem lies in the fact that McKeen cars had no reverse gear. To go backwards, the engine had to be stopped and re-fired in the other direction. McKeen also tried to make a switching locomotive model, which never caught on because of that feature. This gas-electric was once a McKeen car, later converted to a gas-electric by the Chicago Great Western. This tiny Plymouth is about as basic as one can make a locomotive. It appears operable, or close to it. This little Davenport isn't much bigger. It is unclear why the roof is missing, perhaps a clearance problem at its former venue. 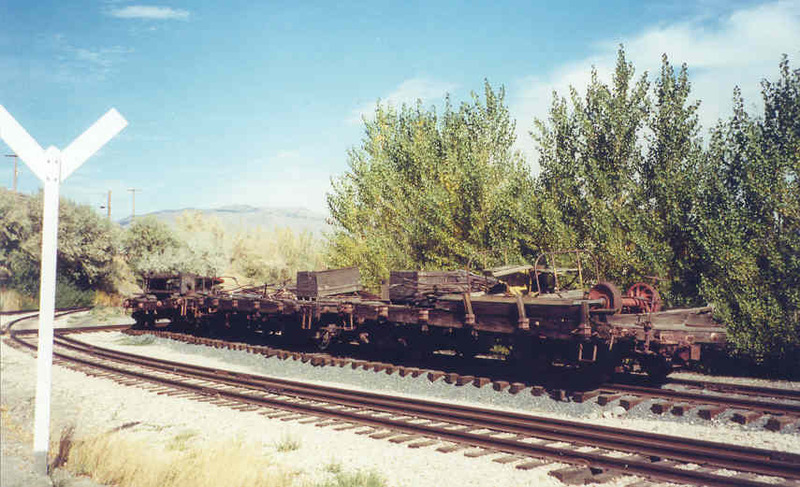 These derelict flatcars have a V&T look, but actually came from the Hobart Southern in California. They were used in many western movies, along with V&T equipment. The remains of this rail-auto came from the Tucson, Cornelia & Gila Bend in Arizona. Back outside, I explore the fenced-in back lot, which contains other truckless passenger and freight cars and two self-propelled carbodys, one, the NCB gas-mechanical from the plumbing shop and another from Wisconsin that was a McKeen before receiving very heavy modifications by the Chicago Great Western to become a gas-electric, then cut down to a switcher. 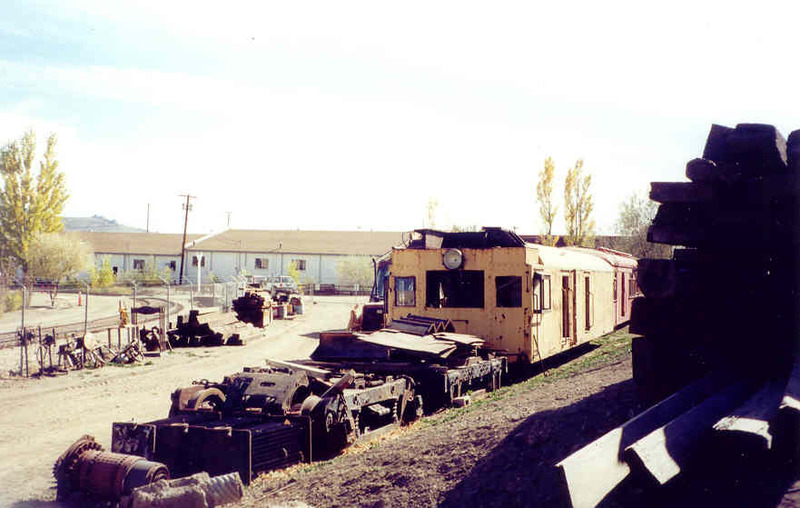 The latter car was acquired by the Museum to provide some parts for the V&T McKeen. 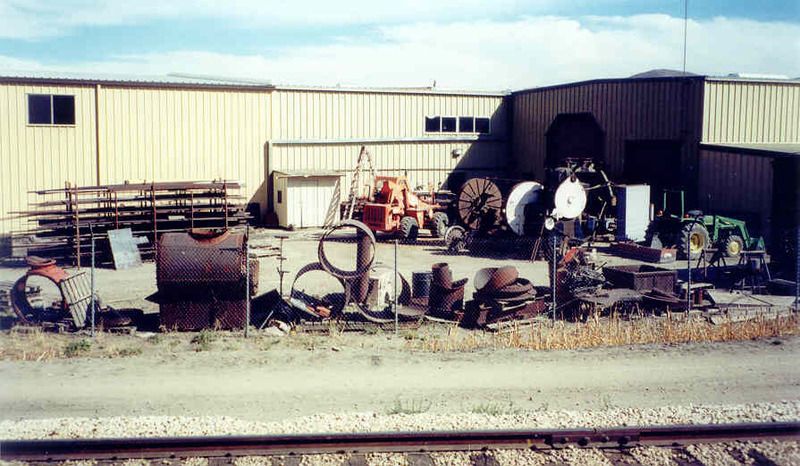 In the compound are a few other artifacts from the Carson City enginehouse, including a jib crane and the smokejacks from the departed structure. 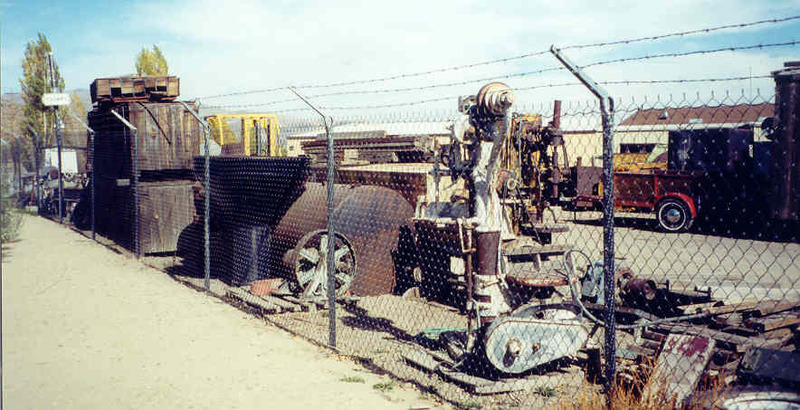 The fenced compound behind the Museum holds numerous artifacts, including smoke jacks from the old Carson City enginehouse, and two self-propelled motorcar bodies. The funnel stack, the dark object just to left of center, is from one of the several movie guises worn by the V&T 4-4-0s. The Museum has a driving wheel lathe behind its storage and shop building, which is said to be operable. Back in front of the Museum, I rejoin my wife for a ride behind No. 8, which is hot and steaming, taking water from the replica V&T water tank. 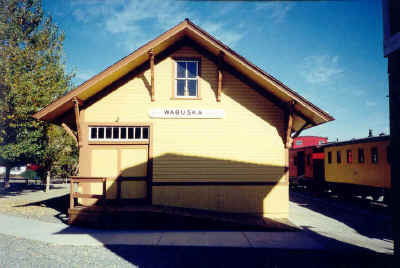 Tickets are purchased in the Wabuska depot, moved here from its former site along the old Carson & Colorado line to the east. The train runs around the circle of track once, then enters a long spur behind buildings along U.S. 395, where it runs around the train, turns on the wye, then re-couples onto it backwards for the next trip. This presumably is done each trip to equalize flange wear. The "loop" around the Museum is actually a circle, in the most basic train-set fashion, without any straight track. There are several spurs off the wye and wooden gallows turntable, and there is considerable three-rail trackage to accommodate visiting narrow gauge locomotives. The museum's depot formerly served at Wabuska, Nevada, on the SP's line to the east of Carson City. The overalled engineer oils around. In reality, he was probably an aerospace engineer in real life, but still looks the part. No movie prop, the water tank holds H2O and serves its purpose. Visit complete, I browse the bookshop, purchasing Virginia & Truckee - The Bonanza Road by Mallory Hope Ferrell, plus a restoration study for the McKeen car. With the former book, author Ferrell has outdone himself again; it is a wealth of photos and information and a bargain at fifty bucks. I'd have been more knowledgeable if I had purchased it before visiting Virginia City. The afternoon is spent driving and walking around Carson City, including the Capitol grounds. A dozen years before, a major source of sadness for me was the loss of the ancient V&T enginehouse here, a loss so tragic I almost wanted to cry when it was destroyed. Completed in 1873, the huge, block-long structure formed a giant "U" shape, with the bottom of the "U" facing east. That year, a grand ball was held inside to celebrate its opening, then one of the biggest buildings in the whole west. There were 11 stalls for locomotives, with the two wings of the structure housing repair and construction facilities for locomotives and cars, plus a foundry. 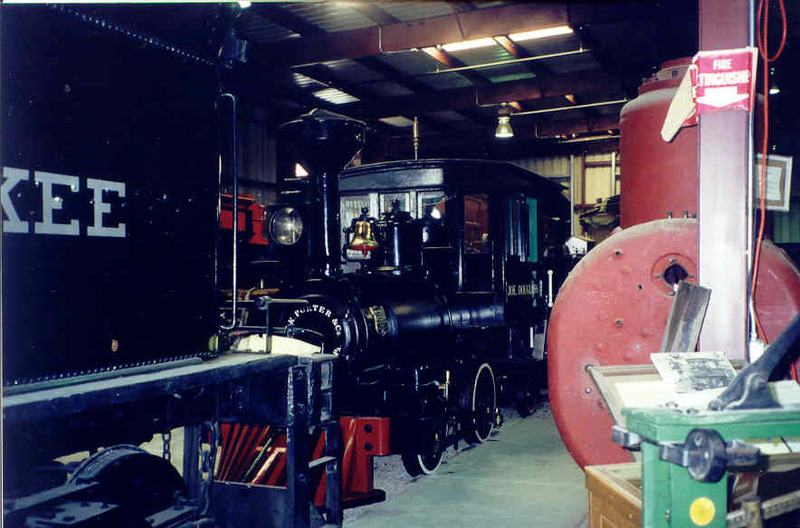 The facility was capable of most all locomotive repairs, and also did much work for the local mining industry. The 11 stall tracks originally led out to a 55-foot Sellers turntable. In later years, the three southernmost tracks bypassed the table. At one time, the south stall serviced the narrow gauge Carson & Colorado locomotives. After the V&T's demise in 1950, the grand old building was purchased by a California individual, who did little with it, though several proposals came and went. Public acquisition was attempted at least once, with the idea of a V&T museum in mind, but the effort failed due to the owner's high price demands. One of the last efforts was a private venture to turn it into a casino/shopping facility, with a V&T locomotive on display inside. That too never happened, and the structure fell into further disrepair. One section of the roof fell in, there was a fire, and the city declared it an unsafe structure, that firefighters would not enter if it burned again. There was a last desperate local attempt to save it, part of which held that it provided shelter for a clan of feral cats that had taken up residence. In the end, the heirs of the original owner had it taken down in exchange for the stone blocks, which were reportedly sold to wineries in the Napa Valley. Thus, the magnificent, historic structure, built of sandstone blocks hand-quarried by prison labor, was no more. The resulting public outcry did not save the enginehouse, but brought about a state historic preservation fund, to aid in saving future endangered buildings. This empty lot is where the huge V&T shops stood until 1990. Sadly, even if they still existed, the surrounding area has been so developed that their reuse as an operating museum would not be practical. Driving around, I know that the building was near Stewart Street, which has two large vacant lots where it might have been. Consulting with the map in the Ferrell book, I learn that it was the northern of the two; the lot remains mostly vacant, with some slight encroachment. 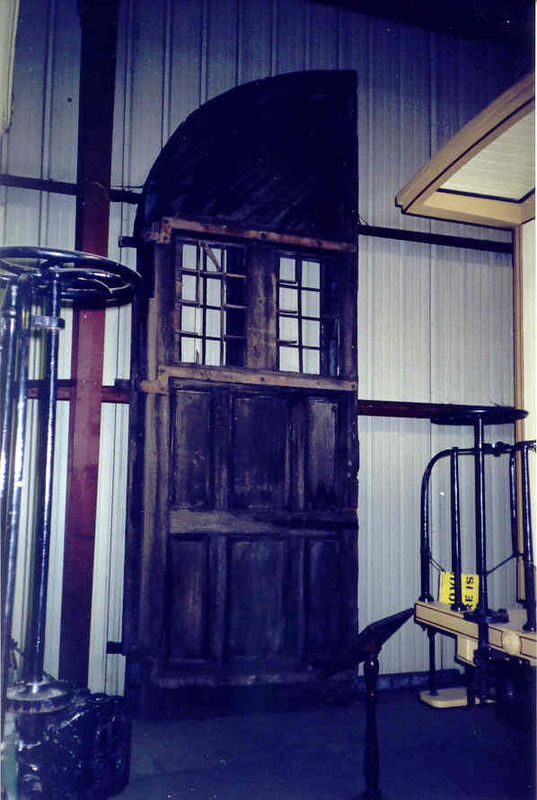 When the enginehouse was dismantled, I simply could not understand why so little was done to save it, nor why a completely new museum was ever begun in a non-historic location on the then southern edge of town. For a long time after the tragedy, I felt that had I been a local resident, I would have lain in front of the excavator that tore it down. Actually visiting the city, however, provides a dose of reality. 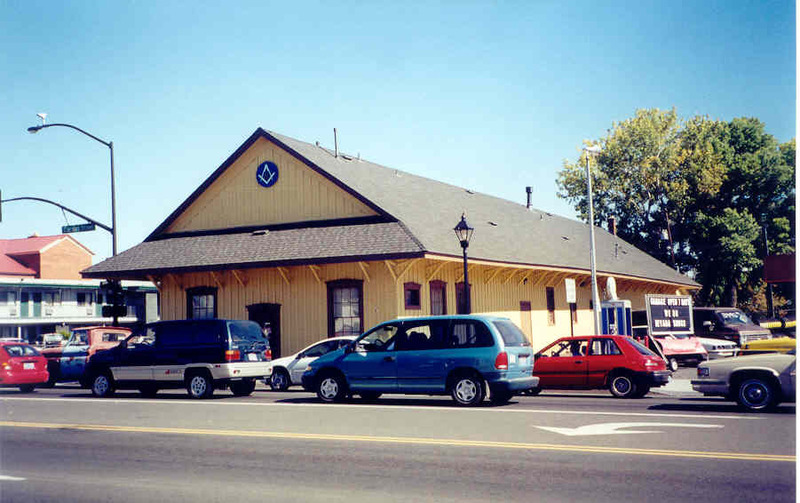 Carson City's famous old depot still stands in good condition, housing a fraternal order, but surrounding new development dictates no trains will ever stop here again. When the V&T was abandoned in 1950, Carson City's population was about 3000. The residential area was mostly all west of Carson Street. 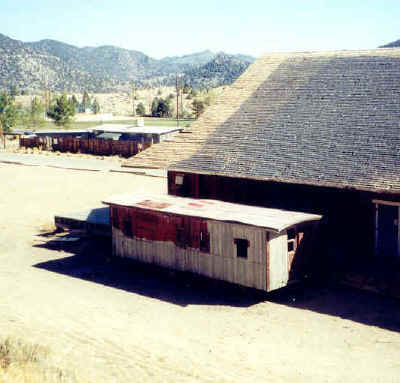 The depot (in good shape and today housing a fraternal order), enginehouse and railroad yard occupied a three-by-eight-block area east of Carson Street, which was then the only paved road in town. In the intervening 50 years, the city has exploded; a sign by the highway indicates there are now over 54,000 residents. It's still a pleasant place, but nothing like it was in 1950. Most of that growth has taken place on the east side. While the old enginehouse lot is essentially still empty, the railyard area near it is filled with modern buildings of all kinds. By the early 1990s, when it was razed, a fair amount of that growth had already taken place; rail operations would not have been practical without condemning numerous private buildings and tearing them down. In Nevada, still an "anything goes" state with few restrictive laws, that would not have been feasible, despite its longtime reverence for the V&T. It remains unclear at what point the old railyard could have been rebuilt without destroying many modern buildings, but it was likely long ago. 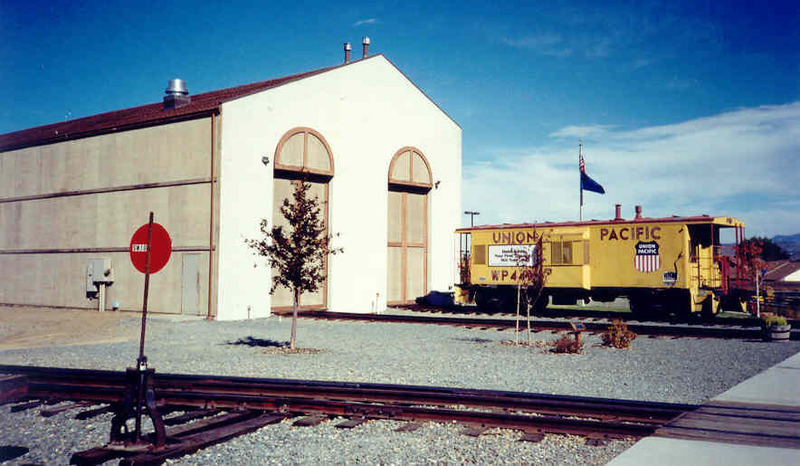 Looking east, this modern building sits directly on the Carson City turntable site. Stewart Street, in the foreground, was extended across the former railyard after the V&T's demise. A "last run" 1950 photo in the Ferrell book tells the tale: Just across Carson Street from the depot is the local Safeway supermarket, a little concrete-block building smaller than most quick stops today. Today, up and down Carson Street are more supermarkets, malls, casinos, motels and restaurants than you can imagine. The Museum, located at the south edge of town when first built, now has at least two miles of businesses beyond it. Though the old enginehouse was razed, its image lives on at this Albertson's supermarket on the east side of town, replete with the 11 stall doors. The end of the day finds us at the Albertson's supermarket on the east edge of town, where a second glance brings an amazing discovery. The fa�ade of the market is designed to look like the old V&T enginehouse, right down to the 11 stall doors. Other buildings in the complex mimic V&T/C&C depots. After all the destruction, one developer at least, had a belated heart for history. The developer also built two depot-like buildings near the market, to house other stores. The last day of the vacation involves only a tiring drive over the Sierra via U.S. 50 and Lake Tahoe. On the way, I miss a Shay and other narrow gauge equipment being rebuilt at Placerville, plus a Christmas tree farm southwest of Sacramento that has some standard gauge 0-4-0Ts, but one can't see it all in one trip. At least I've stood briefly in the shoes of Beebe, Steinheimer and others, and actually seen some of the things and places I've read about since picking up that first copy of Railroad magazine as a child, thus a 50-year old dream has been accomplished. As tragic as the loss of the old Carson City enginehouse was, I think there could still be some hope of seeing the V&T recreated in a more-or-less accurate fashion, at Virginia City. The plan to rebuild the line 17 more miles down to the edge of Carson seems to enjoy good political support, especially since Nevada no longer has a monopoly on legalized gambling and seeks to cultivate tourism revenue. Much of the land it would traverse is under government ownership, thus avoiding the need for expensive purchase. 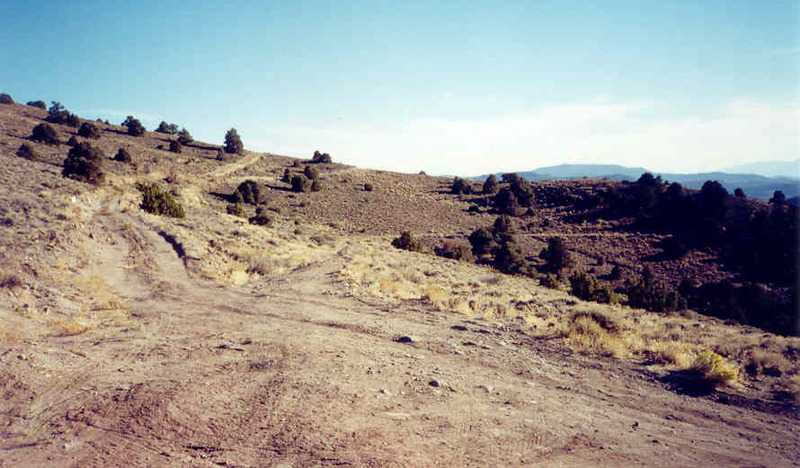 The original V&T right-of-way remains clearly visible down to the outskirts of Carson City. 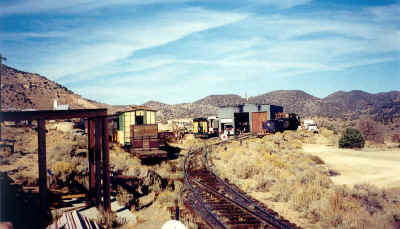 The present operation at Virginia City is a railroad alright, but not much effort has been made to make it a true historical recreation. At present, it is a private operation, with all paid employees, and has been able to make a successful go of the venture over nearly 30 years. That in itself is an amazing feat these days. Using the Heber Creeper model from Utah, public acquisition and investment could increase funding and make improvements, assuming the American economy recovers from its present doldrums. 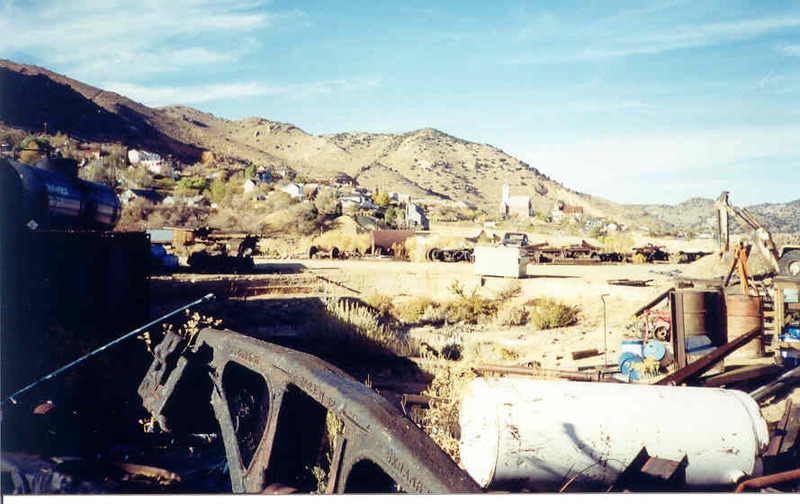 Were it up to me, I would move the modern maintenance terminal down to the south end of the line near U.S. 50 and make the Virginia City end as historic as possible. The present two-stall metal enginehouse would serve well for this purpose, and as a pre-fab building, could be moved. The original Virginia City roundhouse was a simple wooden structure, relatively easy to replicate. 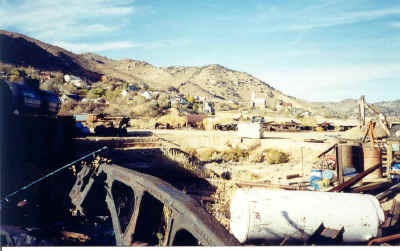 The original turntable was moved to Mason Valley, Nevada after abandonment and is believed to still exist; the pit is still open. 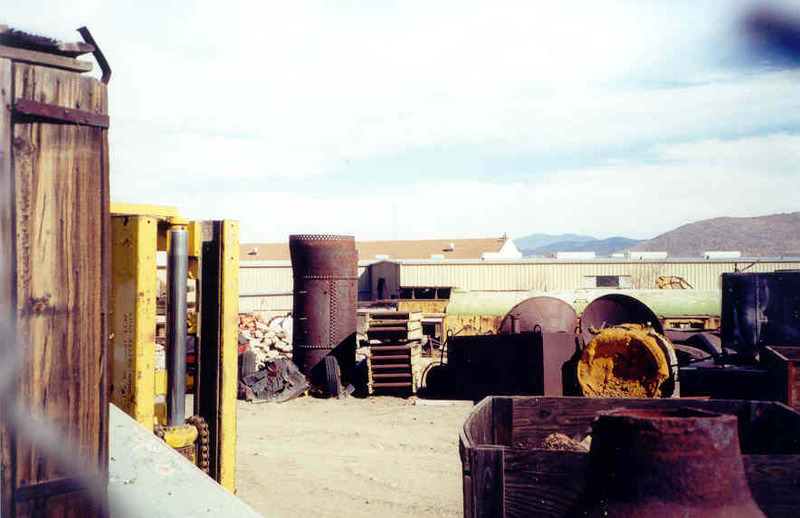 Behind this junkpile is the original stone-lined V&T turntable pit. A former WP turntable was acquired, to be cut down to fit, but recently traded with Portola, to become part of a planned roundhouse reconstruction there. The original V&T table is said to exist at Mason Valley, Nevada. 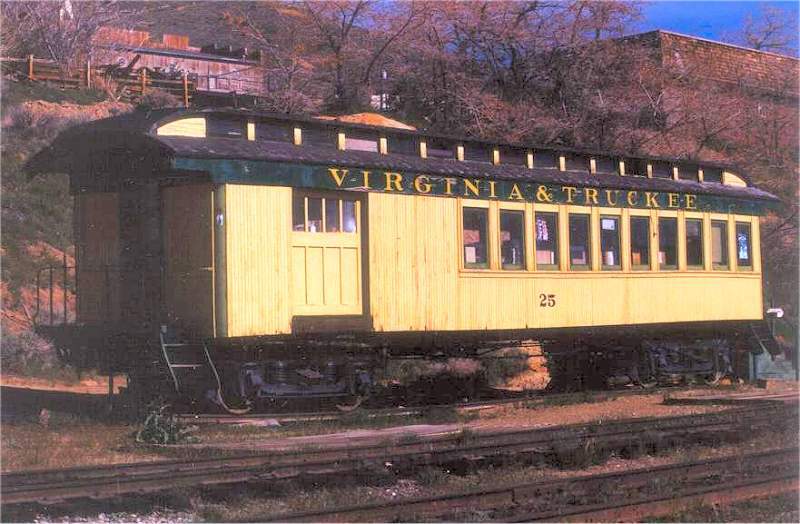 The V&T depended almost exclusively on stub switches and "harp" switchstands, and trackage in Virginia City should reflect this. The present rail in that area, scrounged from old industrial sidings, is fairly light and pretty close to what the V&T had. Further down the main line, heavier relay rail would be less noticeable. 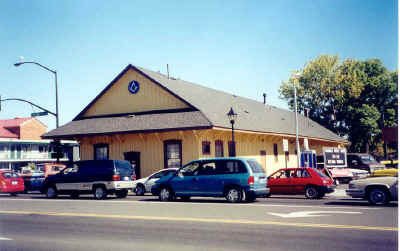 The second passenger station would have to be replicated, but the old freight station remains intact, owned by persons sympathetic to the railroad. To reach these structures would require reopening Tunnel No. 6, in front of St. Mary's Church. A nearby shelter for passenger cars could perform the same function again if replicated (link to photo on the Comstock Carshops website). The rebuilding plan assumes construction of new old-looking coaches, with steel frames for safety, similar to those on the Durango & Silverton. Considering that some 50 pieces of real V&T rolling stock exists, it might not be unreasonable to see some of it out on the line for special occasions, however. The real V&T locomotives are considered somewhat fragile also, but it might not be unthinkable to complete repairs on No. 27 for some usage. American-type No. 11 (link to photo on Comstock Carshops website), aka Reno, is the worst off of the surviving motive power, having been damaged by fire at Old Tucson in Arizona. Some sources indicate its boiler has already been ruined by a failed conversion to compressed air operation; were that the case, a replacement boiler could make it usable again. The remaining cars (link to photo on Comstock Carshops website) at Old Tucson are in bad condition also, probably so deteriorated or burned that only the hardware (link to photo on Comstock Carshops website) would be usable. The present site of the Nevada State Railroad Museum is cramped by strip development, and the land may be more valuable for that purpose. As a long-term goal, it might not be unreasonable to think of moving the whole place to the south end of the recreated V&T, creating an attraction at both ends of the line. The two metal buildings, if not moved, could house a gigantic Jiffy Lube and car wash, befitting their surroundings. It's probably too late to get the stones from the original enginehouse back from California, but it's a thought. Will it ever happen? Hard to say, but there are some bold visionaries out in the Silver State. Another plan even calls for rebuilding the rest of the V&T between Reno and Minden, and possibly the Carson & Colorado, for modern freight and passenger service. While that may remain a pipe dream, rebuilding the Virginia City line looks to have credibility, and I wish those attempting it all the best.